Last night’s sunset was in the east! While I was playing chess during the Back to the ’50s classic car cruise in La Mesa Village late yesterday, everyone started running to the sidewalk, holding their cameras and smart phones up in the air, and taking pictures. Since the cars normally are on the ground, I put my chess game on hold and went to see what all the hubbub was. It was a spectacular sunset, but it was in the east instead of the west. Global warming? Out in the eastern desert was one huge mass of clouds (in my native Texas it would be called a “thunderhead”) with the sun reflecting off it. The sky was an intense blue with bright golden and purple clouds. 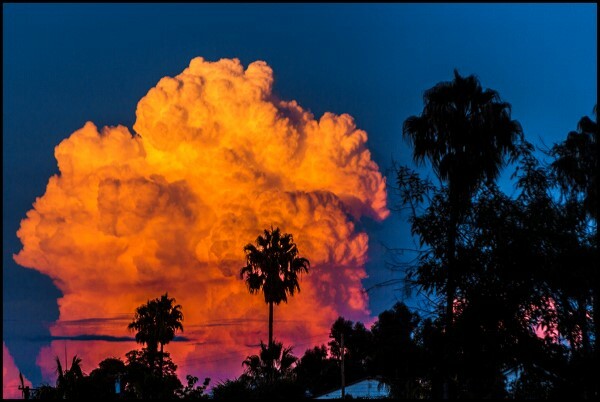 This entry was posted in Photos, Picture of the Moment and tagged sunset in the east, sunset la mesa california on August 23, 2013 by Russel Ray Photos.